In a comment this week Dizzy suggested I republish this post because she thought it was an oldie but a goodie. And since I seem to be having a hard time getting my act together this week after being away all weekend I thought I would comply to her suggestion. I actually enjoyed it when I reread it and thought you might all enjoy it too. So without further ado here it is. There is one thing or actually a big group of things in my home that are looking down the barrel of being decluttered before the 365 days are up. The group in question are my old sports trophies. I have mentioned these before and still haven’t done anything about them but the day of reckoning is coming. Trophies come under the same banner as souvenirs and little trinkets that serve no other purpose but to remind you of days gone by. They scream “look what I did”, “look where I’ve been” and maybe even the sad cry of “I’m living in the past”. Personally unless your future appears dull and you aren’t likely to create any new achievements or live any new adventures do you really need to live in the past. No matter what your age or circumstance you always have the ability to make new memories, achieve something new and possibly visit new places. My bad shoulder may have put an end to my softball and indoor cricket days but there are plenty of interesting things to do with my time like reaching out to a world of people with my blog to name just one. Sure these old adventures and achievements are worth remembering but they weren’t so dull that you need clutter to constantly remind you of those days. 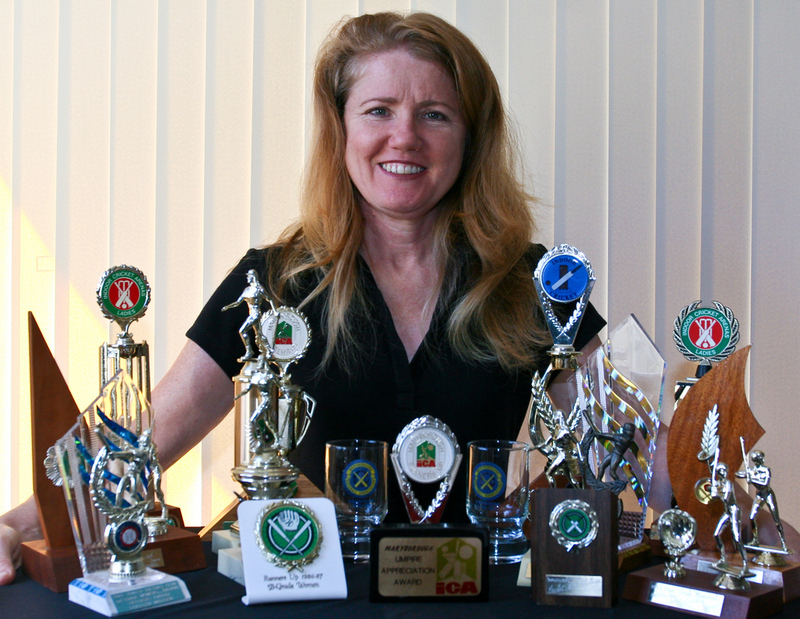 I know I don’t need my trophies to remind me of the good times I had with old friends and the individual set of talents I had that contributed to our sporting achievements. I will always remember those days and the great lessons learned from some wonderful coaches and mentors. I just don’t need to dust those memories every week. I will however get my husband to photograph the trophies and I may even save the little plaques from the front of each of them but even then I expect I will rarely look back at those photos but they will be there just in case. It wasn’t until May this year that I finally decluttered the trophies. Why did it take so long? Because with the 365 approach to decluttering I did it when I was good and ready. When a good method of disposal presented itself I grabbed it with both hands and sent them to be recycled by the trophy store near my house. I don’t know how much of them they used but it was a better option than just throwing them in the trash. And here is another piece of memory clutter from way back. This flower press holds some flowers that my husband gave me before we were married. Being as we have been married for almost 24 years I think we have created enough new memories that we don’t need to cling to these old ones. I watched American Pickers tonight and saw the agony on one old guys face parting with two very special bikes. I am so grateful I am not attached to my stuff like that. These people must go to there grave with thousands of dollars worth of stuff left behind for someone else to deal with. Dizzy, I’ll let the experts (aka: Colleen, Cindy) answer your question as to ‘de-cluttering’ 30 cm of hair. However, I will share with you (and it’s been a while) my experience: I did away with long hair, the hair products (yup, even shampoo, I’ve gone the no-poo route and love it) the curling irons, the coloring and upkeep (but I kept a small travel size hair dryer for use in the winter). It was and still is absolutely freeing for me [and it decluttered the bathroom, too]! I have short hair because after spending $75 dollars every 8-12 weeks for a perm to keep it looking nice then still having to have all of the “glop” to put on it and curl it I decided it was crazy. I now have short hair and I can wash it and go for the most part. Once in a great while I may get out my curling iron and make it a little fancier but that’s it. I dumped several different sizes of curling irons, all sorts of hair care projucts and gained lots of time and money. Freedom is right. that sounds wonderful. My husband says the cutting my hair off is akin to serving divorce papers which adds a degree of difficulty I don’t want to deal with. I am sure he is only partly joking but I know for myself that the idea of short hairs sounds so much easier but I think there is a reason I have only had it short for two short periods in my life ~ I look like crap with short hair. I can’t help thinking that maybe there is a hairdresser out there who knows the perfect cut for me and one day I might just stumble upon them. High hopes I know! Men almost always prefer long hair. I’m not sure why. I don’t know that my haircut is the best for me but it sure makes life easier. It means I don’t have to have my arms in the air trying to work on it which means added pain to the pain I already have from the fibromyalgia. I hope you one day find THE hairdresser. I will probably find The Hairdresser and then have to move somewhere else. That is the one part about moving that I don’t like, new hairdresser, new dentist, new doctor blah blah blah… sometimes even new toilet paper but thats a whole other story. in the case of tutoring wayward youths “turning up” is a big achievement and deserves rewarding. I never even owned a curling, straighning iron, I was never friend of conditioners, masks, foam, gel, and what other stupid hairproducts you can get, but I do have favourites in shampoos. with my current hair (chinlengh and undercut) I found a special volume shampoo that is really good. I gave away all others. oh and I just moved in into my new flat – the bathroom is tiny and I can put away every item (its not much) behind the mirror and into a little drawer. there is nothing standing around except soap. I love it. that is a good idea to try shampoos in sample size bottles first, because there is nothing more annoying that having to do the use it up challenge on inappropriate products. One could end up looking hideous for months on end. I must admit I am like you, although I have used nearly all of those said products I am really over it now. My hair laziness is the key to my discontent with my look. I love a good hair day, I only wish I could sting together a good hair month. I have a small bathroom too. I was just as well I used up all my products before moving back to Australia from the US. Everything fitting into the new tiny bathroom and I have never felt to need to clutter it since. Memory decluttering is such a good thing. I remember a couple of years ago when I was decluttering my studio/office area. I came across this box of cards and letters and other memorabilia from the past. They were from a time when I really needed the recognition of people to boost my ego. I read through them all and then let them sit for a few days. then I read through them all again. I shredded the letters and threw out the cards. I kept only 2 items and that was because they were from two classes I taught. Earlier this year I also threw them out. I have a few pictures of things that represent that period of my life and I think that is enough. Last week I spent a large amount of time deleting pictures from my laptop. I had 1000’s of pictures. Most of them I have either scrapbooked, put in regular picture albums (family pics) or they are extras from some event. I have deleted most of them. If I have a copy somewhere why do I need them on the computer? A friend was horrified that I got rid of them. What about later? What if the copy I have gets destroyed? When I am gone there is no one to pass them on to or who cares really. Why worry about it? So out they went. It was quite freeing. It is all a form of memory keeping. Looking back, if I had it to do all over again, I would not have scrapbooked all of those pictures. I realized that while I enjoyed doing it, I have spent a lot of money and taken a lot of space in my bookshelves with something no one else cares about. Just a few days ago, I thought about this passion of preserving photos. What for? I think it stems from a time, when photos were made only a few times in a lifetime and were really precious items to remind you of persons. In my family, we have the ‘precious photos’ box in which there are photos of my great-grandmother or my granny’s wedding etc. I do love those photos and enjoy to see what my ancestors looked like. But there are only about 5 photos of my granny from the time between her birth and her wedding. – if I compare that to the amount of pictures that exist of me… I think, it will be interesting for my future children or grandchildren to look at photos of me as a child – but I doubt that they will be interested in piles of picture albums. Even less in all these random things I took digital photos of over time. Well yes, maybe that flower WAS pretty – but if not even I bother to look at that picture, because it doesn’t really mean anything to me – why would I want that to linger around longer? i think you are right, we have continues the process of preserving the past but haven’t taken the proliferation into account. at least with your scrapbooks you had fun creating them. Sometimes the outcome isn’t what it is all about and one day you might decide to declutter them as well. Who knows. Taking apart the trophies and saving the little plaques is brilliant. And I bet we’ll get rid of the plaques eventually. Baby steps, right? This post also gave me an idea for what to do with some of the things I have from Mom: 4H fabric patches, Victory Garden records, and a newspaper clipping about a sewing award she had won, all from the 1940s. It’s a mixed bag – a record of personal achievement combined with historical interest. It’s all been in a box since her death in 2004. But now, out they’ll come and into a shadowbox frame, along with her high school photo. Much better than languishing in a box in the closet. (The frame was in the closet, too.) Thank you for the inspiration! that is a much better solution to languishing in a box in the closet. Well done! I need to get to that box for a second go round myself. And I love the last part of your comment ~ I still have the most important thing from that day. I have no plans to declutter him. I feel the same. It seems we are all at the same stage – 24 years married, decluttering, and now this! I attacked that box and book only two days ago. A book with all the wedding planning and decisions in it, together with a list of engagement cards and gifts, and a list of wedding cards and gifts. Also in the book were samples of stationery and wedding dress materials. ….. And then, in the box: – all those listed cards, both engagement and wedding, together with the draft of my thank you letters for each! I have kept the book and samples; the local kindergarten children can enjoy the pictures on the cards, and the message half is now in the recycle bin. That thinned things out a lot! Now …. about the baby cards and presents ……. P.S. No husband decluttering here, either! many of us do seem to have a lot in common. One of these days I will tackle the keepsake boxes again too. It must be the year for decluttering wedding memorabilia. After 26 years of marriage this summer, I went through my wedding box as well and got rid of most of its contents. My husband only wanted to keep one item. As you did, I wondered why I had kept these things for so long. Was it validating our marriage? Was it some kind of trophy that our marriage had lasted for over a quarter of a century? Why do we save the things we do and for so long? Even now I feel I could part with what’s left in it and not miss it. As you said, I still have the most important trophy from that day and I still remember who he is. 🙂 I think I’ll just go and take another look inside that box. Hi have one word to explain the reason for keep this stuff ~ TRADITION ~ we keep it because that is what people do. I am fairly sure there is no other reason. We rarely look at them and we don’t need them to prove anything so why clutter up our houses with them. When we die the next poor sucker feels obliged to keep them for history’s sake. I think it is time I started going through my keepsake boxes again. I can feel a purge coming on. I have that same reaction whenever I watch the American Pickers show too, about how sad it is that it seems like such torture for some of these people to part with any of their stuff. The ones I don’t understand at all are the ones that have building after building after building packed to overflowing with stuff, yet it’s hard for them to part with just a few things. With that large a volume of stuff, how on earth could anyone even know for sure what they had, especially in the places where it’s all just tossed in there, and the Pickers have to clamber over piles before they get to the “good stuff”. I find American Pickers to be a great “booster” and motivation to keep decluttering regularly, and keeping the amount of stuff under control. I wouldn’t deal well being surrounded with that much stuff. It makes me feel claustrophobic. other sad thing about that show is the many of the “hoarders” are so old that not too far in the future someone else is going to have to deal with that stuff. Mind you some of them stand to get rich in the process, but what a process. Urgh!!!! I agree with your sentiment that American Pickers is “a great booster and motivation to keep decluttering regularly.” My husband and I enjoy watching the show, but some of the places they visit cause me to feel overwhelmed and a bit claustrophobic and panicky. The history of some of the items is interesting, but all that STUFF!!! when I see that show I feel that it is a crying shame not to have the stuff in a museum where many people can enjoy it. I satisfy myself with the idea that the picker guys are at least selling it on the people who at least display it nicely and not just hoard it buried in a shed somewhere under a pile of other stuff. I think ruthless is the way to go sometimes. Once they are gone the decision is made and often even if there are a few regrets they are often easier to live with than the procrastination. I coach cheerleading and instead of giving them trophies at the end of the season I make the scrapbook pages that they can put in a frame now and then later add to a photo album or scrapbook instead of hogging a huge box like mine still do. and welcome to 365 Less Things, thank you for dropping by to leave a comment. I think that sounds like a great idea. Much less space taken up that way and no dusting required. I love this one Colleen. You put it into such clear perspective. It makes me feel so happy that I’ve moved past being extremely attached to anything. There are a few extra things in my life for sure, but it would not be so difficult to walk away from any of them. Such an inspiration as always! While going through my mother’s belongings I have come across many boxes filled with trophies and plaques belonging to my father. My first thought was that I would photograph them and maybe remove the plates. 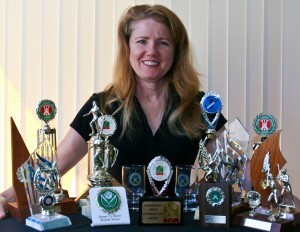 I hadn’t thought about taking them to a trophy store for recycling – what a great idea! 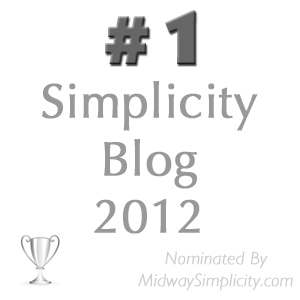 You’re now my read-every-day blog which is a very short list, and I’m so very inspired by your words and decluttering. 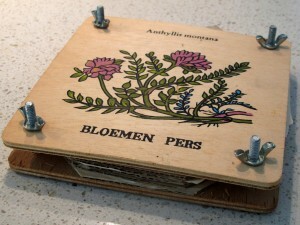 It is funny I wanted a little flower press, and I deleted it from my wish list this week. I usually just press flowers in books to use for decorating cards, and I don’t save the flowers. So why do I need a press? My whole family is enjoying some major decluttering and it has only put a small dent in all we plan to get rid of, but we are all enjoying the space. I even went through the kitchen and gave away tons of things I thought I loved but don’t use. The biggest thing is that I got rid of some sentimental clutter that could be useful to someone else. Thank you for the eye opener that I don’t need objects to connect me to people and memories. it is always my pleasure to help you see that you don’t need stuff. As I always say to my daughter Need, Want, Need, Want, that poor child will be hearing that in her head until the day she dies. The entire wisdom of the concept hasn’t actually sunk in yet but at 22 it is much harder to resist Want than it is at the wise old age of 46. I bet when the time comes, your daughter will remember your ways and come to embrace them. When I was younger, I was less cluttery. My own mom has too much stuff, and it frightens me to see it, and that I have amassed too much over the years. I loved the simplicity of college days and “just enough”. Hi Angela – I’d love to know what other blogs you read daily. And colleen, I’m 25 and I have the need/want message, so you might not be far off! God Snosie I hope you are right. My other daily reads aren’t about decluttering, always, but I’m working my way through the minimalist list on Minimalist Packrat. Check them out if you haven’t! I have been fascinated by minimalist ideas, but I notice that some minimalists sound like they are doing it for selfish reasons-not bad exactly, but not the way I want to go as part of a family. That’s why I LOVE this gracious blog! Here are my daily reads: smallnotebook.org, soulemama.com, and simplemom.net I have others in my favorites, that I pop in to. I discovered the same thing, that some minimalists are in it for selfish reasons. That is, that they just want a reason to be lazy, bludge of others and be responsible to no one. Hopefully that is a very small minority though. Much the same as some bloggers only jumped on the band wagon to make money out of it and that is the main focus on their blogs, continually self promoting. My plan was to help others. Maybe one day I will make some money out of it but if I do I have certainly served a long apprenticeship first. P.S. Way to go for having the message already! I started aquiring too much when I got married, had more space, and especially had children! Supposedly I “needed” all of this stuff. I’m having so much fun donating it all to places that will sell/give it to someone and use it for good! we all fall into that same trap. Oh well, wisdom comes with age I guess. This may sound like a rant but here goes. STRAP IN! I too watch Hoarders & the Pickers show, from time to time (just lately it’s on all the time & repeats, maybe therein is the message) and it reminds me not to hang onto something that will probably be tossed after I’m gone. It boggles the mind what some people see as precious, surrounding themselves with mostly crap and in some cases Crap that reminds them of Crap times but they can’t let it go. Sad to say that when it is that extreme, professional help is required but I think it is a good little reminder that we need to change our ways as a community and help those that just can’t see the Crap! Trauma, loss, grief, deprivation at some stage, overindulgence in general, can trigger many reactions, I feel the trick is to notice the reaction and try to provide the action with loved ones, friends, workmates and others. This subject alone could go on and on, I do feel though that the changing of ways & habits regarding ‘OUR STUFF’ is definitely progressing, slowly but getting there. Lets face it we didn’t wake up one morning to find someone had turned our homes into dumping grounds overnight of whatever it is that clogs up the arteries and corners! In essence we are providing the ‘map’ to others to ‘navigate the tunnel’. We can all, at some stage see the light and we’re heading towards it, we just have to try and steer those we may hear lament “OMG I have to do something about the mess in my House” in the same direction. ‘Baby Steps’. After all isn’t that what led us here, for me it was a few blog hops that I think was through a Scrapbookers blog, from there it was a jump to a comment that led me to ‘Be more with Less’, which high-lighted ‘Minimalist Packrat’ which threw me face first into ‘365’ THANK GOD!! hahaha! In my years of moving, aquiring, travelling, purging, moving, aquiring, purging etc etc, I have managed to turn others around (my bro escaped me for a bit) and they in turn can see the beauty in reduction and a little simplicity. It really is contagious. My thanks to Colleen for flicking the first domino & creating ‘365’, to Cindy & all of you for keeping everyone here going! In saying all that, to all the scrapbookers out there, if you love what you do, keep doing it, just find ways to simplify it, the options there are ‘baseball card protectors’, these help to keep things small & compact whilst still enjoying your craft! If anyone is interested check out Becky Higgins.com, she has created a simple project to keep it all minimized and still enjoy the memory keeping. I personally love scrapbooking but I do have it in hand and I’m keeping it ‘special’ so it will remain used & looked at when I’m gone! Hopefully not until I have completely reached my desired spaciousness! You can un-strap now and go de-clutter something, I’m going to do my hair, No wait, I don’t have too hahaha!! Love & hugs all round! Good rant Dizzy. You really should be writing your own blog if for no other reason but to get things off your chest. I love the leapfrogging you did to get my my blog but glad you made it here. you are so right too that there are many reasons we accumulate out clutter in the first place and that is one of the places to work on not just how to get rid of it when you realise it is too much. As for scrapbooking I realised fairly into that hobby that I was a minimalist scrapbooker and followed that path. I even stopped subscribing to several magazine because their style had gone so far down the cluttered page (where the hell is the photo anyway) look that I just couldn’t stand looking at them. It was a case of consumerism gone made again. The more stuff they could convince you that you needed on a page the more money the suppliers stood to make out of you. They didn’t fool me. Well smooth legs and beautiful red hair, you lucky doer! Love red hair, mine was originally deep auburn, ‘Titian Copper’ the hairdressers used to call it! Mind you that was before the ‘Platinum Blondes’ started to appear throughout my hair, then I graduated to the badger stripe coz I coloured it. hahaha. Just had to share this with you all. I know I should have dealt with this ages ago but I found my son’s baby card box! WTH!! should I do! I want to toss 90% of them so I asked my son if he wants me to put them in his album or toss them, or what??? He said and I quote “I’m here aren’t I, I was born, friends and relatives welcomed me, half of them aren’t here any longer, 1 quarter of them are no longer in my day to day life for whatever reason, the other few that I still see or hear from can go in the book”. Profound and very enlightening (for one so young) Then he said, “Mum thanks for asking but I don’t need to read a card to know I’m loved!” What a star! I shall get him to choose, cut and put in his book the ones he wants to remember. you must be so proud of your son. I am going to dig out the ones my kids got too and run the question by them. Yes, don’t feel bad you aren’t the only one who is a while dealing with this kind of clutter. I have no personal attachment to it I just haven’t got around to it yet. Well I have been through it once but it is time to deal with it again now that I have acquired more wisdom. need to go and find a washing mashine, have a good time, ladies. Colleen, if you haven’t posted about this already, in lots of areas in the US at least, there are drop offs and pick ups for donations. One local organization only does pick ups of donations. I have started scheduling regular pick ups so I can declutter in chunks, and we have the option to drop things off in between if needed. This is a great option for someone with a mass amount of things that need to be donated and need a big van or truck to pick it all up at once! Nice! I prefer to leave my readers to investigate the donations opportunities in their own neighbourhoods because every one is different to the other and every country is different to the other. I did once do a little tutorial on googling to declutter.I’ll see if I can find it for you. It wouldn’t hurt to write another one though. Aha!!! After reading more of your archives I believe I know who ‘Tricky Situation’ is and the reply post says they all got it sorted! I think it is L and I do hope it was resolved and no one got hurt! I’m also happy to say that all the Mini missions along the way have come in handy, I have de-cluttered bits and bobs along with reading about your journey. Aren’t you a clever little spy. Here is the result of the “Tricky Situation” ~ I (who will remain unnamed) was talking to my sister and best friend about the dilemma, and my sister offered to take it to Queensland and put it in her living room, as she really liked it. She knows the friend who painted it, so if the friend ever asked (which she hasn’t, and I see her twice a week), I wouldn’t feel bad telling her what happened to it! So win-win. Sometimes I wish I had started to blog from day 1 (which was actually day 3 but why complicate this more than necessary). I learned a lot in those first three months scanning through minimalist blogs and other decluttering blogs. Just wanted to let you and everyone know that earlier this year I had decided to take part in a ‘lose your hair for charity’ well as things went I didn’t get to register in time & life happened and all that goes with it. When I chopped off all my hair, a customer ( who is a hairdresser) was commenting on the fact that they still consider it ‘losing your hair’ so all my customers that were going to sponsor me have still done it! Adding the receipts up, over $1000.00 has been donated to various Cancer Charities so I am really loving my new hairdo! If any of you feel the urge to donate drop some coins into a cancer charity tin. There are quite a few events happening so instead of buying something donate to a great cause and help those that have succumbed to what can be a horror of a health issue! I’m going ‘PINK’ for pink ribbon day and the next big ‘CROP’ I’ll be sporting a very short purple crop & colour! Good for you Dizzy and good on your generous customers. Cancer research is a always a good cause to donate to that’s for sure.